Roof Cleaning Can Help You Sell That House! While the housing market is slowly rebounding from one of the worst slumps in decades, many homeowners that are trying to sell are brainstorming creative ways to differentiate their homes from the rest. Some have the interior painted, some work on the landscaping, while others will actually go so far as to throw in gifts like electronics and furniture. But very rarely does it occur to these folks that their filthy, algae-covered roof is probably keeping the buyers away! Imagine a potential buyer pulling into the driveway of an otherwise beautiful home, but the roof is covered in some kind of mystery “black stuff”. They’re going to think to themselves that the roof is sick and may even need replacing (although it just needs to be cleaned). They’ll be adding up the cost of a new roof before they’ve even stepped foot inside the house! How’s that for lousy curb appeal!!! Sellers can’t afford to be this careless with how the exterior of their home looks. That bad “first impression” that the potential buyer has will often trump any upgrades or features that are inside the house. Roof stains and/or moss could also catch the attention of a home inspector who might decide to make negative comments about it to his clients, who in turn offer less than they would otherwise. The answer, of course, is to hire a professional who utilizes the Ultra Low-Pressure techniques. That $250.00 to $600.00 that you spend on a roof cleaning could garner you an extra $5,000 to $10,000 or more when it comes time to sell as a result of perceived greater value (new looking = healthy roof! ), and it doesn’t take a financial genius to see that that’s quite a return on your investment. The black spots and streaks discoloring a roof is more than likely the pervasive and prevalent algae known as Gloecapsa Magma. These algae love to feed on the calcium carbonate in most asphalt shingles. This loosens the shingle’s granules causing your roof to deteriorate faster and lessens its ability to reflect heat. This ultimately leads to higher utility bills and a much shorter shingle life. Our eco-friendly process removes this algae and is safe on plants, animals, siding and your roof’s shingles. It’s safe, fast and effective. 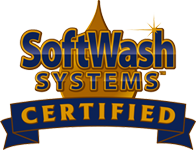 Our special solution kills the algae and our specially engineered rinse system gently rinses away algae without any damage to your shingles. NO HIGH PRESSURE WASHING !! We offer several options making it affordable for all. We even offer a referral program making it possible to get your roof done for free. There’s NO HIGH PRESSURE on your roof and we PROMISE NO HIGH PRESSURE SALES! Please contact us if you have questions or would like for us to visit a property and evaluate the roofs stains.